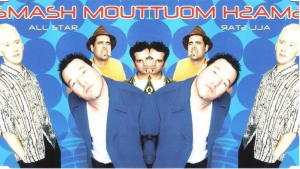 There are very few songs that unite people as much as Smash Mouth’s iconic 1999 hit “All Star” does, and for good reason. It’s a catchy (although admittedly corny) tune, it has a wholesome, positive message within the lyrics, and it’s a sentimental reminder of simpler times. It may be popularly known to be a “meme song,” but that should not deter from how significant it is in pop culture and with our generation. To retire it would be sacrilegious. Who said songs that become memes are bad? I think if a song is memorialized by becoming a meme, that means a lot of people love that song, and “All Star” is just one example of that. Whenever I hear this song performed in karaoke, a club, or anywhere with a conglomeration of people, the whole establishment erupts in cheers and everyone in the room starts singing along. I think any song that brings such joy to so many people, no matter how overplayed it is, should be celebrated. Since many of us grew up watching the movie Shrek, it’s understandable that “All Star” is such a nostalgic song. This explains why it’s so popular with millennials as a meme-y song from an equally meme-y movie. However, forget for a moment about the meme-ification of “All Star”—it still has a great message in it. Despite the song being 20 years old (and 18 years since the release of Shrek), it’s as relevant to our time as it was before, perhaps now even more so. Yes, it’s an old, cheesy song from an era rife with cheesy songs. It may have sprung into popularity ironically because of how cheesy it is, but that is only a testament to how important the song is to our generation. Honestly, it brings me great joy to know that despite all of our differences, we can still be united in our love of the same dumb song that was in the intro of Shrek. It may be a corny, overplayed song, but it is one that defines our generation.